Bulk pricing makes this perfect for Hospital Chapels and waiting rooms. 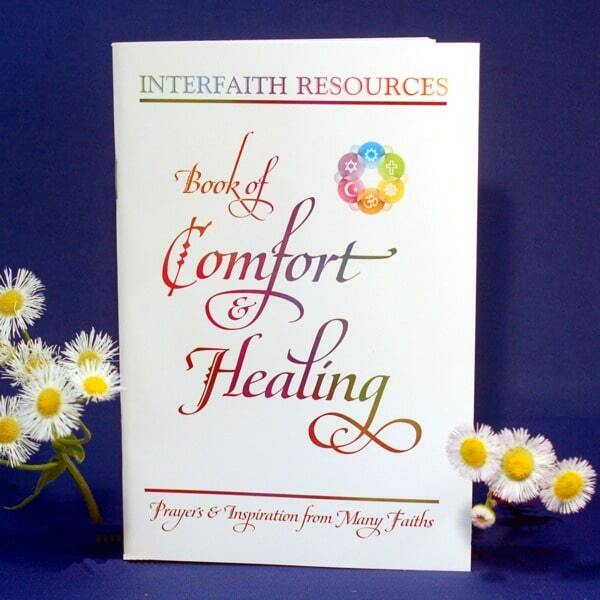 The interfaith approach of this book gives almost everyone who reads it an entry-point from which to receive guidance and insights. The well-chosen selection of prayers and quotations addresses a wide range of needs and concerns from a variety of perspectives. If you work with people who are struggling with difficulties related to physical or mental health, then you will find this booklet incredibly helpful in your practice. When made available in a waiting room, it can calm and comfort patients and prepare them to hear whatever information you have to share with them. During consultation or counseling, it can act as a focal point for exploring difficult issues. After a visit, or when left in chapels or lounges, it can comfort and support patients, family and friends in your absence. The 210 prayers and quotations come from Christianity, Judaism, Islam, Buddhism, Hinduism, Sikhism and the Bahá’í Faith, with a few quotations from Zoroastrianism, Taoism, and Sufism, plus a few “Interfaith” selections as well. The booklet itself is designed to be attractive, easy to carry, and, most important, affordable, with case pricing available. It is 4.75×7″ and 64 pages long with a full-color cover and dark blue text. Over 20,000 have been sold to over 50 hospitals in 25 states. Hospitals that have purchased by the case have found them so effective that they have ordered additional cases. (One hospital ordered over 1,300 in one year). This is the give-away edition. If you are looking for something a little nicer to give to a friend or to leave on your bookshelf for reference, consider choosing our GIFT EDITION instead. This booklet coordinates with our Meditations on the Life to Come, for people who are approaching the next stage in life’s journey. Note: If you represent a hospital or other institution and would like to receive a sample copy or receive a PDF file of the contents for review purposes, please contact us. If you have purchased one in the past, please feel free to leave a review. If you are interested in the case price, call for Media Mail shipping, which is much less than the Priority that is available online.